This is an excellent book for anyone wanting to start learning some more complex looking wire jewelry making. Petersen pushes the edges of the box when working on her own jewelry making ideas and lucky us that we get to benefit from her creativity. 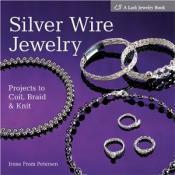 This is a book you'll want to have if you’re looking for a simple, easy and skillful way of making woven wire jewelry. The authors present a contemporary way of doing woven wire wrapping that is quite appealing. I was really looking forward to learning the more advanced wire weaving techniques in this book. I got what I wanted from it, which was to learn the wire weaving techniques that I needed to learn. This is pretty much the "bible" if you're interested in wire art jewelry. Although it's not your typical “how-to” book on woven wire jewelry techniques, it presents an overview of many woven techniques found around the globe.